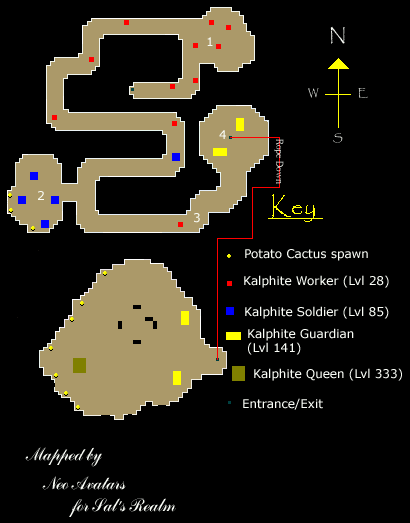 The Kalphite Queen is one of the most difficult monsters in RuneScape. She is level 333 and is located in Kalphite Tunnels, west of Shantay Pass. She has 2 forms. First one is a bug-like thing, while the second one is a wasp. Both forms needs to be killed before you can obtain the drop. Instead of teleport runes, you could use a House Teleportation Tablet (Teletab) or a Camelot Teletab. 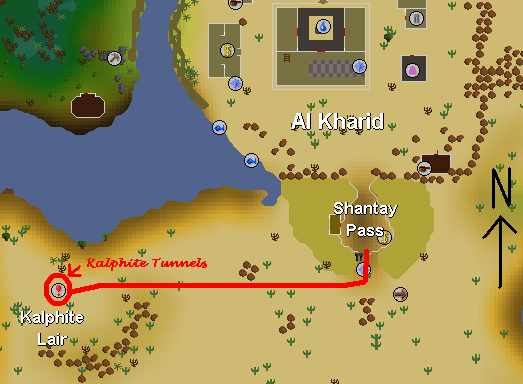 If you have a Player Owned House with an Altar set up (along with an Amulet of Glory on your wall) , you could teleport to your house, recharge your prayer, and then use the Amulet of Glory to teleport back to Al Kharid. Mages or Warriors - Glory Amulet, Full Mystic, God Cape, God Staff or an elemental staff, gauntlets of some sort, mage boots and a Duel Ring (for a quick escape). Probably a Dragon Sword or Scimitar as well. Ranged - Full Black Dragonhide, a Magic Shortbow, Glory Amulet, Robin Hood Hat and Range Boots, Dragon Sword or Dagger (p), and a Duel Ring. It will be more difficult going against the queen using these equipment sets, but just about all of these items can be replaced for a lot less than a full Barrows set. Go through Shantay Pass and run to the west until you see an entrance to the tunnels. Use a rope with it and climb down. Now your partner (or you) should use a rope with the entrance and climb down. 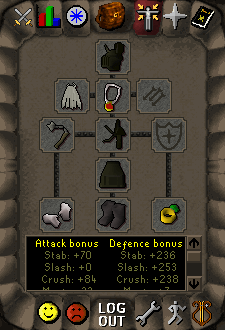 When you get down, put on Magic Protect and Protect Item (if you die you will save full Veracs. If you do not item protect, you will lose Veracs Helm). This way she will be spinning and she will not hit you as often. The first form is fairly easy because she only has Protect From Range and Protect From Magic on. After you kill first form she will start transforming. Now, the second form is a bit harder because she uses Protect from Melee. Your Veracs set will ignore her prayer most of the time and will hit like it normally does. After you kill her, pick the drop and teleport to the Duel Arena. Tip: Turn Auto Retaliate off. If you do so you won't attack other workers if they attack you when you eat a shark or drink a potion. 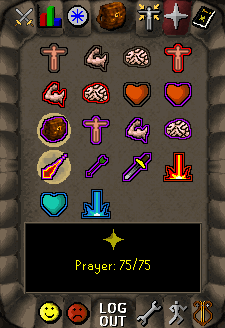 When you teleport to Duel Arena you can share drop here then run to the main building and heal with the help of nurses and pray at the altar, or you can just challenge your partner to heal after the match is over. Return to the Shantay Pass and repeat the process. Good luck with Kalphite Queen hunting!